Mark Blevis, who has been tracking twitter mentions, is performing this analysis to check whether twitter mentions are useful in predicting the outcome of an election. Personally I'm not convinced (especially since the theory failed in the recent Nova Scotia elections), but I love the spirit behind tracking political statistics. The theory that social media engagement correlates to voter engagement certainly isn't without merit, though I'm sure many other factors are also important. If we ignore Gordon Ward for a second, there's a very strong (R2=0.96) correlation between followers and mentions. This makes a great deal of sense, and all evidence points to a certain proportion of followers of each candidate being engaged in the election discussions on twitter. But what on earth is going on with Gordon Ward? He's only had twitter since just after nomination day and already has over 6,300 followers. Virtually nobody mentions him on twitter, though, and the majority of his posts have barely any interaction with his followers (very few retweets or favorites, for instance). Take a quick look at his followers, and you might discover a pattern - for the vast majority of them, their ratio of following to follower is extremely high, many of them over 25:1. Many of Mr. Ward's followers have fewer than 10 tweets and are not from Canada. Scroll through a couple of his followers and you'll see what I mean. 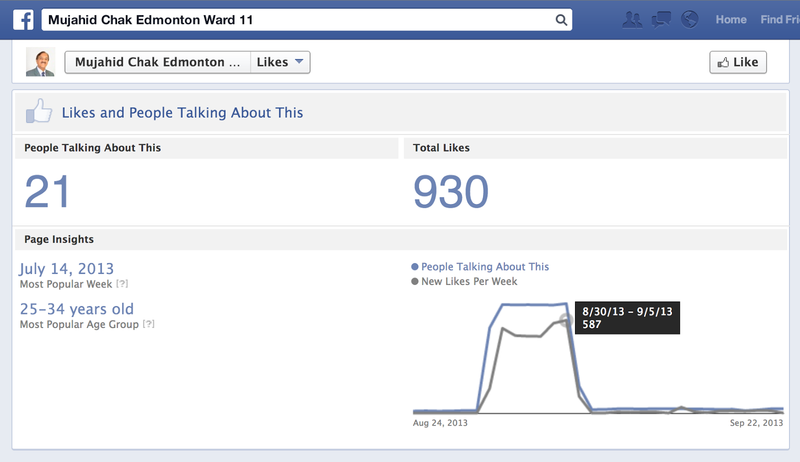 Needless to say, these are not the accounts of engaged Edmonton voters. Don Iveson wasn't wrong when he called an election a "communications exercise" - a candidate's ideas surely aren't worth anything if nobody ever gets to hear them. Unfortunately, this often results in election candidates resorting to attacks or half-baked publicity stunts to gain the spotlight and have attention drawn to them. Voters often simply don't have the time to pour over every candidate's platform in detail, and often will only pay attention to candidates who they perceive to be popular. Just like any other communications or marketing problem, the ability to create a 'buzz' around yourself is key to winning an election - only once people think you're worth their attention will they care about your ideas. In book sales, for instance, it's not uncommon for new authors to hire firms to buy up thousands of copies of their books in order to briefly appear on best-sellers lists. Showing up on a best-seller list gives the author added credentials, gets the book noticed by consumers, and will likely drive future sales. Books and elections candidates are remarkably similar inasmuch as they are judged often by their covers (though dissimilar in that people actually enjoy movies based on books). Much like publishers buying up copies of their own books, candidates can use online services to inflate their social media presence. If you want to boost your twitter account by 5,000 followers, you could pay $30 and get them within a week. Or maybe 25,000 Youtube views for $100 here. 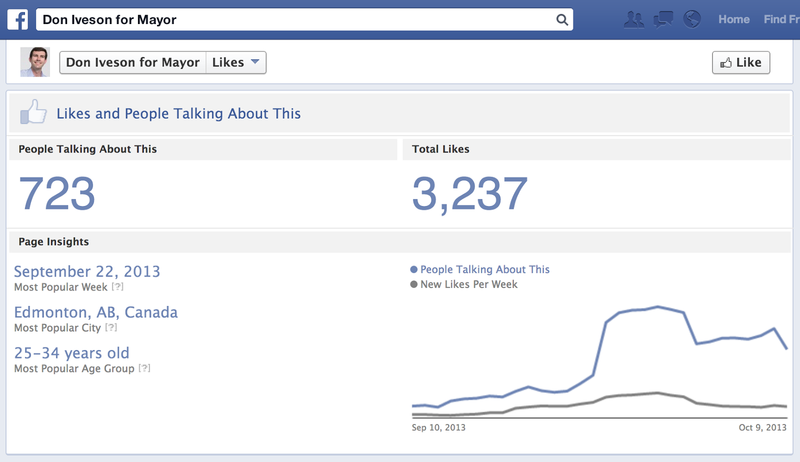 Perhaps 500 Facebook likes for $42? Just like seeing a book on a best-seller list makes people more likely to pay attention to it, having a lot of twitter followers or Facebook fans gives the impression that a candidate is credible and popular, and can hypothetically be valuable in kickstarting a successful campaign. If Gordon Ward had used a service like this (hypothetically, of course), he should probably ask for his money back - being followed by an army of 6,000 zombie twitter accounts doesn't seem to have gained him much momentum so far in this election. 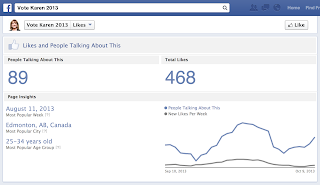 The grey lines in the chart represent the sum of all new likes over the previous week. 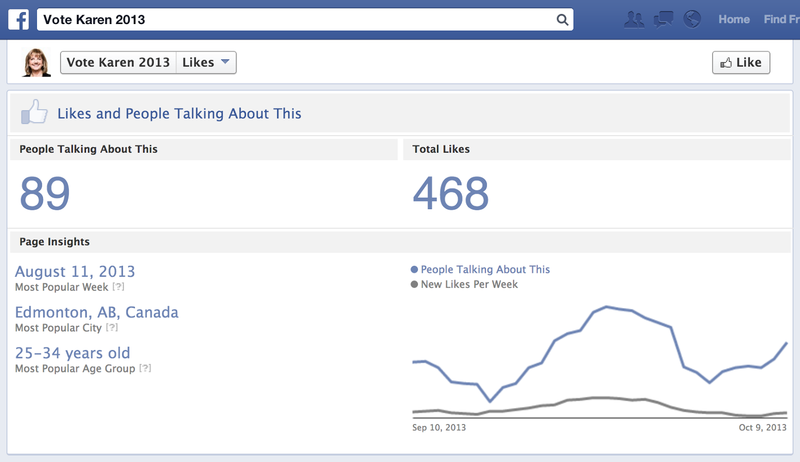 For instance, from the week of September 2-8, Mike Nickel received 453 new likes. Impressive. However, from the week of September 3-9, he received 0. The implication here is that, on or around September 2nd, Mike Nickel all of a sudden got ~450 new likes on his page, and then didn't get any more until the lead-up to the nomination day. 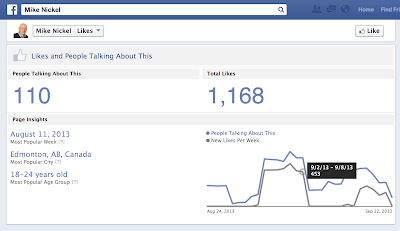 The graph for Mujahid Chak is similar, with approximately 580 new likes occurring right at the end of August. On the other hand, the values for mayoral candidates fluctuate a bit around nomination day, but don't show any of the sudden changes or plateaus of these other two candidates. Now maybe this was a case of incredible luck for both candidates. 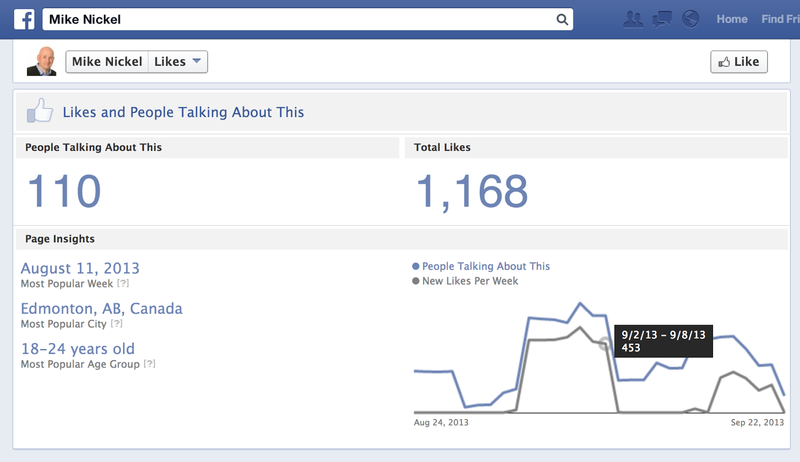 Surely there's a chance that they aren't cheating and buying Facebook likes. 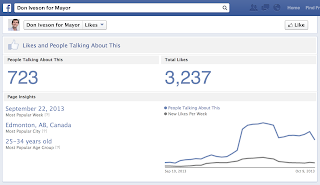 Perhaps Mr. Nickel had a tremendously successful Facebook hangout and convinced a bunch of people to like him all at once, or maybe Mr. Chak only started his page on August 30 to an incredible amount of fanfare (and subsequently was ignored by the general Facebook community, judging by the "people talking about this" metric...). Admittedly, the first few pages of results are pretty clean - lots of Edmonton citizens, fairly legitimate-looking profiles, etc. 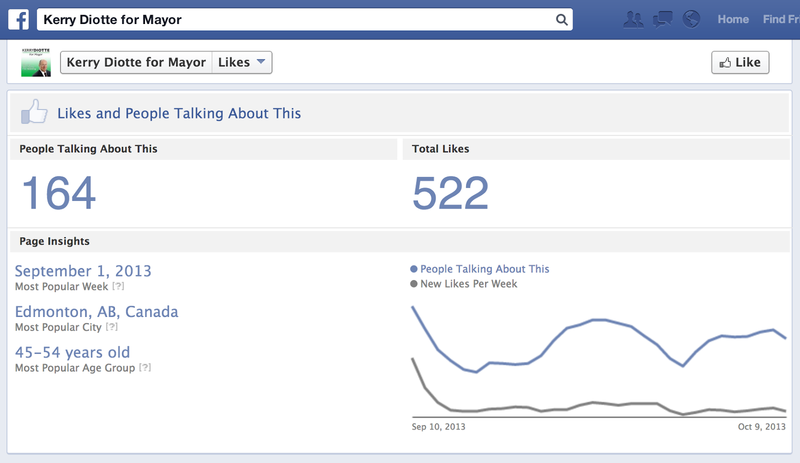 After about page 4, though, the proportion of people from Edmonton drops significantly. 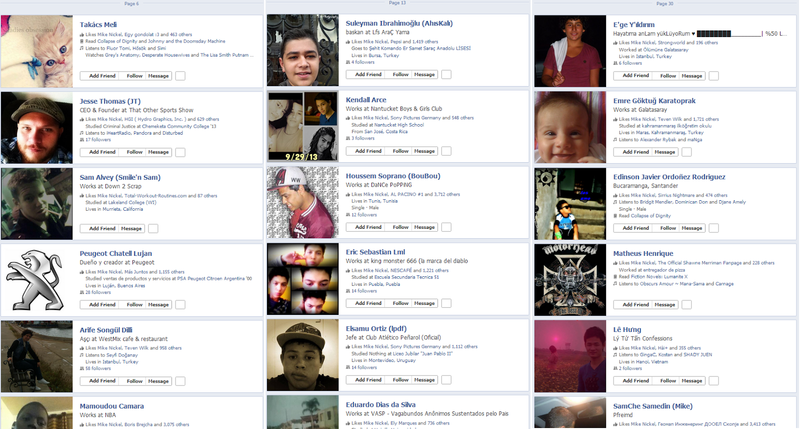 Apparently Mr. Nickel is supported by people from California, Buenos Aires, Uruguay, Turkey, Tunisia, and Vietnam. Broad support base indeed - in fact, of the people who like Mike Nickel and listed their location, 89.1% of them were listed as living outside of Edmonton. Mujahid Chak's supporters with listed locations were even worse, with 92.9% living outside Edmonton. I of course am open to an innocent explanation for the international social media popularity of some of Edmonton's election candidates, and I can of course sympathize with the desire to be noticed during an election. Though there's nothing illegal or necessarily improper about artificially inflating your social media presence, I personally find the practice to be deplorable. Note: I did a quick check of most high-profile election candidates for this analysis, but not as in-depth (as they seemed fine). If you happen to notice any others with irregularities, please let me know! Other possible explanation (on Facebook at least): poorly run Facebook campaign without drilling down to Edmonton residents in the demographics. Some people are still thinking "everyone should know about this!" when they do marketing.